Social Activism in Southeast Asia brings together cutting-edge accounts of social movements concerned with civil and political rights, globalization, peace, the environment, migrant and factory labour, the rights of middle- and working-class women, and sexual identity in an overarching framework of analysis that forefronts the importance of human rights and the state as a focus for social activism in a region characterized by a history of authoritarian developmentalism and weak civil society. Drawing on contemporary case study material from Cambodia, Indonesia, Malaysia, Myanmar, the Philippines, Singapore, Thailand and Timor-Leste, contributors explore the ways in which social movement actors engage with their international allies, the community and the state in order to promote social change. 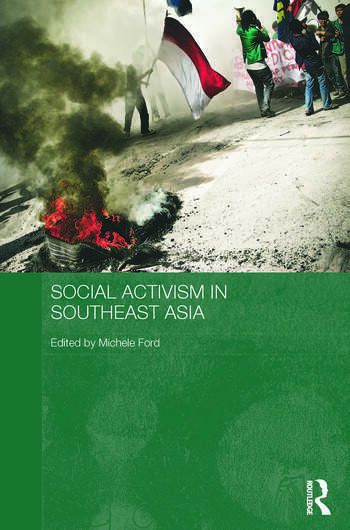 In doing so, they not only provide detailed and nuanced analyses of particular movements in particular parts of Southeast Asia; they also address difficult questions concerning the nature of social movements and their politics, strategies and claims to authenticity. Michele Ford is Associate Professor in the Department of Indonesian Studies at the University of Sydney. Her research focuses on the Indonesian labour movement and organized labour’s responses to temporary labour migration in East and Southeast Asia. She is the author of Workers and Intellectuals: NGOs, Trade Unions and the Indonesian Labour Movement (NUS/Hawaii/KITLV 2009) and co-editor of Women and Work in Indonesia (Routledge 2008); Women and Labour Organizing in Asia: Diversity, Autonomy and Activism (Routledge 2008); Indonesia Beyond the Water’s Edge: Managing an Archipelagic State (ISEAS 2009); Men and Masculinities in Southeast Asia (Routledge 2012) and Labour Migration and Trafficking in Southeast Asia: Critical Perspectives (Routledge 2012).